SQLite Diff is a graphical comparison tool for SQLite database files, comparing both the schema and the data. Schema results include comparisons of tables/columns, triggers, indexes and views. Changed SQL code including trigger SQL, index creation SQL, view creation SQL code and changed data records are displayed as colorized highlighted text to make it easier to see the differences between the compared files. ...... application to start the comparison process. SQLite Diff uses a high performance in-memory store of both SQLite schemas to perform most comparisons within in a few seconds. The data comparison feature optionally compares each record within the dropped files using the ROWID as the primary key. - Quickly compares SQLite schema: Tables/Columns, Triggers, Views, Indexes. - Record by record data comparison between each file. 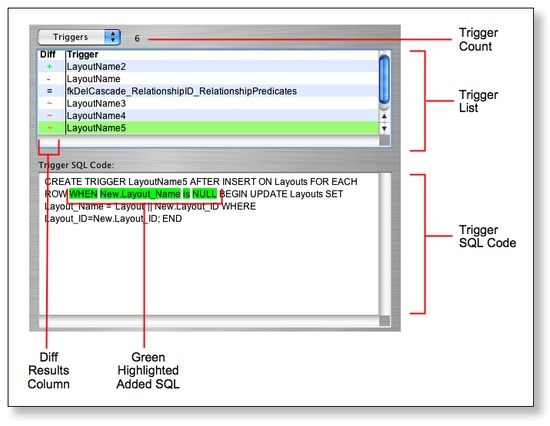 - Colorized SQL and Data highlighting makes it easy to see changed SQL and data. - Optimized for analyzing undocumented or poorly documented SQLite schemas. Qweas is providing links to SQLite Diff 1.21 as a courtesy, and makes no representations regarding SQLite Diff or any other applications or any information related thereto. Any questions, complaints or claims regarding this application SQLite Diff 1.21 must be directed to the appropriate software vendor. You may click the publisher link of SQLite Diff on the top of this page to get more details about the vendor.